TO CAPTAIN GEORGE HOPE, H. M. S. DEFENCE. You will, with the Agamemnon, take a station West from Cadiz from seven to ten leagues, by which means, if the Enemy should move, I hope to have instant information, as two or three Ships will be kept, as at present, between the Fleet and your two Ships; and it seems thought by Captain Blackwood that a Ship or two may attempt to drive the Frigates off, and if that should be the case you will be at hand to assist. I am, Sir, with great respect, &c., NELSON AND BRONTE. TO THE BOATSWAINS OF H. M. SHIPS VICTORY, AJAX, AND NEPTUNE. Victory, off Cadiz, 15th October, 1805. Captain Lechemere of His Majesty's Ship Thunderer, having on the 25th September represented to me that Mr. Richard Keefe, Boatswain of that Ship, had left his duty, and not having returned previous to her sailing from Cawsand Bay, was 'Run' upon the Ship's Books on the 17th of that month, at the same time requested that I would appoint another Boatswain in his room, which was complied with, by the nomination of Mr. James Sympson, Boatswain of the Euryalus; and it having been yesterday represented to me by Lieutenant Stockham, in the absence of Captain Lechemere, that the said Mr. Richard Keefe returned to the Thunderer by the Agamemnon; and as it is possible Mr. Keefe did not leave his duty with an intention to desert, although his conduct is very reprehensible, and rather wears the appearance of embezzlement of His Majesty's stores, You are therefore hereby required and directed to repair immediately on board His Majesty's Ship Thunderer, and in the first instance you will call for and most strictly examine the actual charge of stores he had by his Indents from Plymouth Dockyard, together with every article which the said Boatswain may have received from any other quarter, and actually remained on board on the 17th September, the day on which the said Boatswain appears to have been ' Run.' You will then examine the Expense and Supply Books from that day until the 25th September, when Mr. Sympson took charge of the Thunderer, and when the stores that may have been expended or supplied to any Ship are added to the quantity remaining on the 25th September, it will then appear, by comparing this last account with the actual remains on the 17th September, whether any embezzlement or deficiency of stores have taken place in Mr. Keefe's time. As this is a service of very great importance, I must desire that you will strictly examine into every particular before mentioned, and that you do actually see every article of stores at present on board the Thunderer, and likewise compare the Expense Book during the short time Mr. Sympson has been Boatswain, which stores you will deliver from his charge into the charge and custody of Mr. Richard Keefe, the former Boatswain. And the more effectually to carry this order into execution, it is my directions that the Master and Captain's Clerk of the Thunderer attend most strictly to this service, and that they not only see every article of stores in company with the Surveying Officers, but also render them every assistance and facility in their power, and put their names as witnesses to the said Survey, reporting to me from under your hands a most clear and distinct account of your proceedings herein, stating particularly the deficiency of stores (if any), by mentioning on a separate list the quality and quantity which may appear so deficient, and by what means it happened. N.B. The Boatswains are to remain on board the Thunderer till the Survey is over. TO CAPTAIN HAMOND, H. M. S. LIVELY. TO CAPTAIN HAMOND, H.M.S. LIVELY. Moderate breezes, Westerly. All the forenoon employed in forming the Fleet into the Order of Sailing. At Noon fresh breezes W.S.W. and squally; in the evening fresh gales. Enemy as before, by signal from Weazel . Moderate breezes, North Westerly. Sent the Donegal to Gibraltar to get a ground-tier of casks. Received accounts by the Diligent Store-ship, that Sir Richard Strachan was supposed in sight of the French Rochefort Squadron, which I hope is true. At midnight the wind came to the Eastward. Fine weather, wind Easterly; the Combined Fleets cannot have finer weather to put to sea. Victory, off Cadiz, 18th October, 1805. Captain Lechmere of the Thunderer having acquainted me on the 25th September last, that Mr. Richard Keefe, Boatswain of that Ship, had left her previous to her sailing from Plymouth, and was 'Run' upon the Books on the 17th of that month, and at the same time requesting that I would appoint a Boatswain in his room; you will be pleased to acquaint the Lords Commissioners of the Admiralty, that in consequence of the above circumstances I appointed Mr. James Sympson, Boatswain of the Euryalus, to the Thunderer. But on the Agamemnon's arrival, I received a letter from the Commanding Officer of the Thunderer, acquainting me that the said Mr. Keefe had joined; and conceiving that his having absented from that Ship was not with a view to desert, although it left on my mind some suspicion of embezzlement of stores, I judged it proper that the most strict investigation of every circumstance should take place, previous to his taking charge of the Thunderer as Boatswain, and therefore, gave an order for that purpose, a copy of which, together with the Report of Survey, and an account of the surplus and deficient stores accompany this, which you will be pleased to lay before the Lords Commissioners of the Admiralty for their information; and at the same time acquaint their Lordships, that although there appears some deficiencies on the said list, yet it is well known to the Sea Lords that many stores are used in fitting out a Ship which (from the various duties carrying on, and the Boatswain being frequently absent on service) are omitted to be duly expended. It also appears that there are some surplus stores, which perhaps may be accounted for in the same way. For 16th read 10th in Mr. Lloyd's letter. We have letters from the Cæsar. It was the Rochefort Squadron that took the Calcutta. She was homeward-bound: so Governor Bligh has escaped, and all the damsels, which were to go out in her, from being ravished by the French. Yesterday, by the Guernsey man, we had the French Officer on board. He belonged to the Magnanime. He says they should have taken the Agamemnon in the night, but they fancied the Oporto and Lisbon Convoy were Ships of War. Four West Indiamen, some Whalers, and the Calcutta, with very few of the Lisbon Convoy, is the fruit of their cruize. The Firstrate sails faster than any of them: five Sail of the Line, three Frigates, and two Brigs. Sir Richard has five Sail; but I think he will have enough upon his hands, and from my soul I wish him well over it. I am a little afraid that [Rear-Admiral] Louis had got a certain distance with the Malta Convoy, but not far enough to secure them from the gentlemen at Carthagena; but I desired him to consider that other Ships wanted water, and that an Easterly wind must not be lost. I therefore hope, if that is the case, he will bring them back to the Rock, and the Earl [of Northesk] must see them safe when his water is completed. Ever, my dear Coll., yours most faithfully, NELSON AND BRONTE. 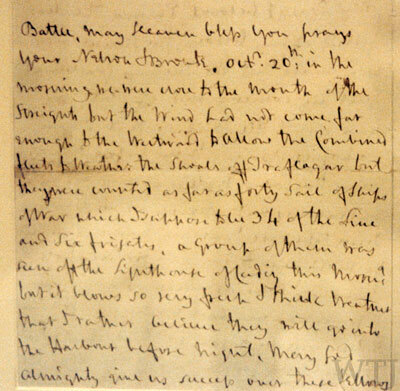 The following letter was found open on Lord Nelson's desk, and was brought to Lady Hamilton by Captain Hardy. It now resides in The British Library in London. The photograph at right is of the last half of the letter, showing Nelson's signature "Nelson & Bronte" on the second line of the page. Some interesting things revealed by this letter are the occasional discrepancies between the "Nelson's Letters" book from which all of these letters are derived, and Nelson's actual letter. In this case, the original shows "Nelson & Bronte", whereas the book shows "Nelson and Bronte". Also, the book uses the word "strait", when Nelson clearly wrote "straight." Victory, October 19th, 1805, Noon, Cadiz, E.S.E., 16 Leagues. October 20th. In the morning, we were close to the Mouth of the Straits, but the wind had not come far enough to the Westward to allow the Combined Fleets to weather the Shoals off Trafalgar; but they were counted as far as forty Sail of Ships of War, which I suppose to be thirty-four of the Line, and six Frigates. A group of them was seen off the Lighthouse of Cadiz this morning, but it blows so very fresh and thick weather, that I rather believe they will go into the Harbour before night. May God Almighty give us success over these fellows, and enable us to get a Peace. TO MISS HORATIA NELSON THOMPSON. Fine weather, wind Easterly. At half-past nine, the Mars, being one of the look-out Ships, repeated the Signal, 'that the Enemy was coming out of Port,made the Signal for a 'General Chase S.E.' wind at South, Cadiz bearing E.N.E;. by compass, distant sixteen leagues. At three the Colossus, made the Signal, that the Enemy's Fleet was at sea., In the evening directed the Fleet to observe my motions during the night, and for Britannia, Prince, and Dreadnought, they being heavy sailers, to take their stations as convenient; and for Mars, Orion, Belleisle, Leviathan, Bellerophon, and Polyphemus, to go ahead during the night, and to carry a light, standing for the Straits' Mouth. Victory, off Cadiz, 20th October, 1805. Captain Blackwood to keep with two Frigates in sight of the Enemy in the night. Two other Frigates to be placed between him and the Defence, Captain Hope. Colossus will take her station between Defence and Mars. Mars to communicate with the Victory. If the Enemy are standing to the Southward, or towards the Straits, burn two blue lights together, every hour, in order to make the greater blaze. If the Enemy are standing to the Westward three guns, quick, every hour. NELSON AND BRONTE [ 5 ]. Fresh breezes SSW. and rainy. Communicated with Phoebe, Defence, and Colossus, who saw near forty Sail of Ships of War outside of Cadiz yesterday evening; but the wind being Southerly, they could not get to the Mouth of the Straits. We were between Trafalgar and Cape Spartel. The Frigates made the signal that they saw 9 Sail outside the Harbour; gave the Frigates instructions for their guidance, and placed Defence, Colossus, and Mars, between me and the Frigates. At noon fresh gales and heavy rain, Cadiz N.E. 9 leagues. In the afternoon Captain Blackwood telegraphed that the Enemy seemed determined to go to the Westward; and that they shall not do if in the power of Nelson and Bronte to prevent them. At 5 telegraphed Captain B., that I relied upon his keeping sight of the Enemy. At 6 o'clock Naiad made the signal for 31 Sail of the Enemy N.N.E. The Frigates and look-out Ships kept sight of the Enemy most admirably all night, and told me by signals which tack they were upon. At 8 we wore, and stood to the S.W., and at four A.M. wore, stood to the N.E..
At daylight saw the Enemy's Combined Fleet from East to E.S.E. ; bore away; made the signal for Order of Sailing, and to Prepare for Battle; the Enemy with their heads to the Southward: at seven the Enemy wearing in succession. May the Great God, whom I worship, grant to my Country, and for the benefit of Europe in general, a great and glorious Victory; and may no misconduct in any one tarnish it; and may humanity after Victory be the predominant feature in the British Fleet. For myself, individually, I commit my life to Him who made me, and may his blessing light upon my endeavours for serving my Country faithfully. To Him I resign myself and the just cause which is entrusted to me to defend. Amen. Amen. Amen.